Luxury, beauty, and a walk on the wild side of Grand Fond await when you reserve La Roche Dans L’eau Villa. The name literally translates to “A Rock in the Water,” and a natural point of view can be found every where you look. Surrounded by a wilder look at the coast of St. Bart’s, here you will find the privacy you need to get away from it all, as well as creative touches like a beautiful rock in the midst of your spectacular beach entry pool. It’s a short walk from sea pools and other natural amenities, and it contains all the luxury you could imagine. Breathtaking pool and ocean views! 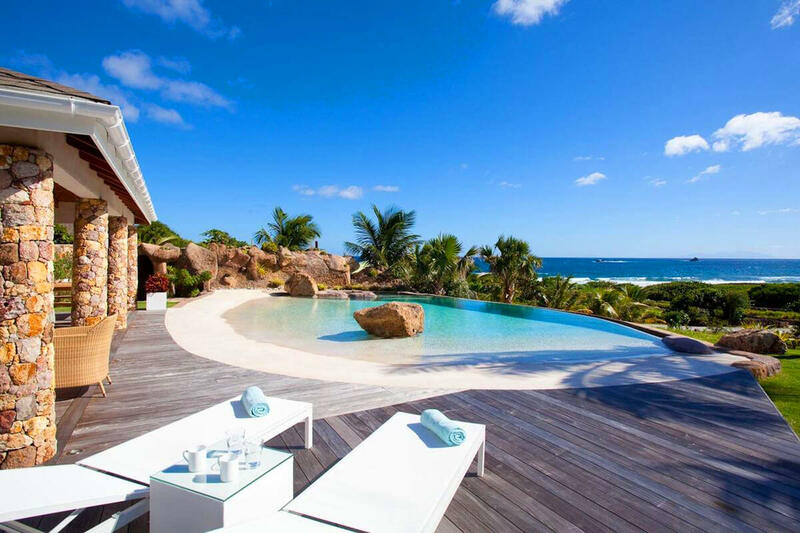 Located in the quiet and wild area of Grand Fond, “La Roche Dans L’Eau” offers an extraordinary view of the ocean and the wild coast of Saint Barts. The outside area with its gorgeous beach style pool facing the ocean is a unique place to admire the sight of the waves crashing on the rocks and the stars at night. This three-bedroom villa is very well-equipped and is perfect for a holiday with family or friends. From “La Roche Dans L’Eau”, you can walk easily to the sea pools and it is a great place for joggers.